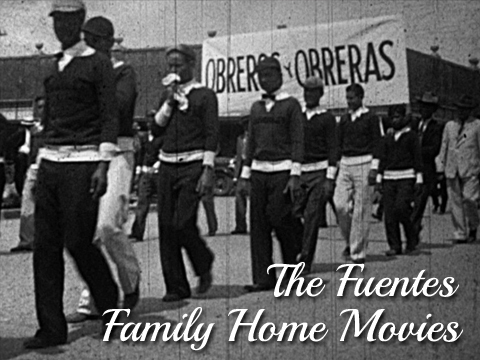 AUSTIN, TEXAS - The Texas Archive of the Moving Image (TAMI) is excited to announce that the Fuentes Family Home Movies (ca. 1920s), preserved by TAMI in partnership with Texas A&M University Corpus Christi, have been named to the National Film Registry, deemed “culturally, historically or aesthetically" significant as announced by the Library of Congress earlier today. Under the terms of the National Film Preservation Act, each year the Librarian of Congress names 25 films to the National Film Registry. The Librarian makes the annual selections to the registry after reviewing hundreds of titles nominated by the public and conferring with Library film curators and the distinguished members of the National Film Preservation Board (NFPB). An avid amateur photographer, Mr. Fuentes’ films serve as some of the earliest motion pictures made by a Mexican-American filmmaker about the Latino community and experience in Texas. His films feature scenes of border life, Mexican-American parades, and, of course, excited children on Christmas morning. The films named to the registry were shot on 9.5mm film, a unique amateur film format popular primarily in Europe. The films were preserved by TAMI in 2015. A selection of the films are available to view on the TAMI website. Antonio Rodríguez Fuentes (1895-1988) and Josefina Barrera Fuentes (1898-1993) were longtime Corpus Christi residents who remained actively involved in early Mexican American community organizations. Mr. Fuentes was born and raised on his family’s ranch near Montemorelos, Nuevo León, Mexico. Josefina Barrera was a native of Corpus Christi. The couple married in 1918. The Texas Archive of the Moving Image was founded in 2002 by film archivist and scholar Dr. Caroline Frick to discover, preserve and provide access to, and educate the community about Texas’ film heritage. By partnering with institutions and individuals across the state, TAMI digitizes and provides web access to thousands of moving images that offer insight to Texas history and culture. Over four thousand of these films are available to view on the TAMI website, www.texasarchive.org.